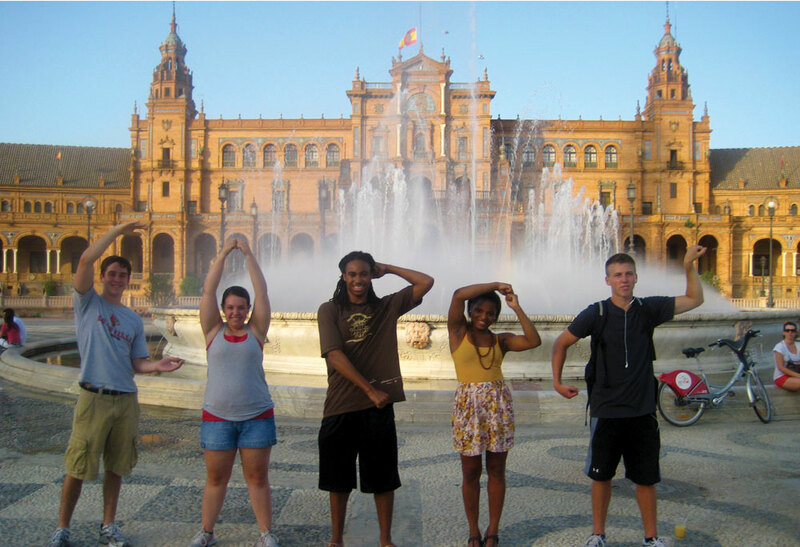 As I have gotten older in college, the one thing I regret is not starting my study abroad adventures sooner. I have been fortunate enough to be able to complete two summer study abroad programs, one in Mexico and one in Peru, but this still does not seem like enough. In the real world, summer break doesn’t exist. This is something that I realized very quickly once I started applying for internships as I got into my sophomore and junior years. After spending 9 weeks in Mexico, I decided that it was okay to stop traveling and start getting serious about finding an internship. I had decided that I had had my time and my adventures, and that phase of my life was over. So, I went out and did everything I could to find a successful internship that I could be proud of- and that’s exactly what happened. In January I was hired at LG&E and KU as an intern, and I could not be happier to be working for one of the most successful companies in our city. I knew for sure my traveling days were over at this point- how could I let myself give up such an amazing job? But the thing about the travel but is that once you catch it, it’s impossible to get rid of. I found myself searching online for 2 or 3-week study abroad programs that I might be able to get approval from my bosses. Having studied abroad before, I know that 2 or 3 weeks is nowhere near long enough to fully immerse yourself in the culture of another country, but I was willing to take an opportunity I could get. Also from studying abroad before, I know that 2 to 3-week programs are hard to come by and typically just as expensive as doing a 4 to 5-week program. I had no luck finding short programs that weren’t astronomical in cost, but I did find a 5-week program to Peru that really interested me. I was terrified of asking my bosses for permission to go on this trip. I was terrified that I would seem unprofessional and that it would impact my ability to get a full-time job once I graduate. But, knowing that this was my last chance to travel, I asked- and I’m glad I did. My bosses were super accepting and excited about my travels. They supported me, saying that I would come back as a stronger employee and knowing that I was working towards finishing my degree. I am so glad that I took the chance to study abroad again. I did it for myself. Moral of the story: book the flight, and travel while you’re young. Who knows if you’ll make it to retirement? My host parents, Hector and Leo. Within the first week of my program, I knew that leaving my host parents would be the hardest part of my journey. I instantly fell in love with their soft-hearted and warm personalities. Every day when I came home from school or any activity, I would look forward to sharing the daily gossip (or “chisme”) with them and staying at the table for hours on end. Our meals together are what I miss the most- this is where I saw my abilities in Spanish really taking off. We would gossip about my Oaxacan “boyfriends,” our lives back home, and the interesting encounters of some of our other group members. My host family always told me that, when I’m staying with them, it’s like I am one of their own. They are what really made Oaxaca feel like home. I am so grateful to be a part of their family, even if just for a little while. Obviously there are Spanish speakers here in the U.S., but it is nothing compared to the exposure of Spanish that I received in Mexico. I loved finally getting to immerse myself in the language and culture of the people that I have spent many years of my life studying. I have noticed that I have to consciously prevent myself from speaking full sentences in Spanish to my friends, or accidentally using a Spanish word to describe something in normal conversation. While taking notes in class, I’m often tempted to use Spanish words in the middle of my sentences. These are things that have never happened to me before, but I love them because it means that my fluency is increasing and that Spanish is becoming a bigger part of my life. In addition, the quirky little colloquial phrases were my favorite thing to learn, and it was even funnier to watch the shock and the reactions of the locals when we used them! I love teaching my friends here new phrases and using them around native speakers here in the U.S. I can’t believe the best summer of my life has come to a close. Being in Mexico was the happiest I have ever been. The constant joy and energy of the culture in Mexico is amazing, and excitement fills the people’s hearts. I love how everyone seems to be in a good mood all the time, and everyone is always so light-hearted. Everyone is constantly joking around, dancing, and laughing with their friends. The vibrancy of the people is something I will deeply miss and keep in my heart forever. I studied in Mexico through a program called Sol Education Abroad, and the people that shared this journey with me are called my “Sol-Mates.” Through this program, I now have friends all over the country, and even a friend from Canada. My Sol Mates and I experienced so much together: we got to explore the world together, try new foods, and laugh at each other along the way. I love that I found other people who share my same love and appreciation for Spanish language and culture, and I loved being “Los extranjeros” (the foreigners) together. I visited a Mexico that is more beautiful than any of the resorts that most people from the U.S. know. Oaxaca has 16 indigenous groups, making it one of the most diverse states in Mexico. Even better, I was in Oaxaca during the entire month of July, the month of the Guelaguetza. Throughout the month there were tons of cultural events, such as parandas (small parades) and food festivals. Oaxaca is also known for its unique cuisine, and this is something I will take with me as well. I already miss the moles, quesillo, tamales, and, most importantly, eating tortillas and beans with every meal. There are certain things that I discovered in Mexico that I will be looking for here in the grocery store, and recipes that I look forward to re-creating. All in all, Mexico will have my heart forever. And I am already planning my next trip back. Literal translation: For everything good, Mezcal. For everything bad, also. This is hands-down my favorite phrase that I have learned here. This phrase is super popular here in Oaxaca because this is the birthplace of Mezcal tequila. It is jokingly said that Mezcal is the solution to any problem you could possibly have, whether it be sickness or heartache. At the same time, it is the thing that you use to celebrate the joys of life. Essentially, this phrase says that Mezcal will be by your side through the good and the bad. Literal translation: Calm down, old man! This phrase essentially means “chill out!”. You can say it when your friend is acting crazy or getting out of hand in a joking manner. Don’t actually say this to an old person, though, because the term “Viejo” has sort of an offensive connotation here- similar to how calling someone old in the U.S. can be taken offensively. This word has a simple translation, but it is definitely something that I needed to know coming here. Guera isn’t an offensive term whatsoever, but it is important to know if someone is trying to catch your attention, or talking about you to someone else. This one is pretty self-explanatory, but it is definitely something you need to know if you plan on going out with friends. If you are out drinking with friends and someone starts this chant, you are “obligated” to finish your drink. I have only been here for 3 weeks and already have a list of 90 new words and phrases I’ve learned! I am excited to keep learning about the colloquial terms of Oaxaca!